Listen here or use the Flash Player to listen directly from this site. All past episodes are available on the Flash Player. Thank you to Quince & Co for sponsoring the podcast! Sign up for their free e-newsletter at http://www.quinceandco.com/. The giveaway for Episode 43 was donated by designer Susan B. Anderson: Hoot Hat and newly released pattern Owl Babies. Visit Susan's blog to keep up with her amazing designs! Owl Baby by Susan B. Anderson. The winner is Chris! Chris was the 51st comment left on May 18, 2011 at 11:29 a.m. Chris, please contact me with your information so Susan can get your new patterns to you! This week's Giveaway is a copy of Hoot Cardigan by Brenna Kotar and 2 copies of Be Mine by Rose Beck. Winner #1 will receive the cardigan pattern and the shawl book and Winner #2 will receive the Be Mine Shawl Collection! Please remember to leave your contact information (blog link, Ravelry name, email) along with your comment below. Aquilterknits shared the IBird Explorer App for $9.99. There is a free lite version. Stringplay reminded me of a favorite poem from my childhood, Song of Hiawathea by Henry Wadsworth Longfellow. This excerpt is from Chapter 3, Hiawatha's Childhood. I read from the book Favorite Poems Old and New. edited for boys and girls by Helen Ferris. c. 1957 received from my grandparents for my birthday. I continue knitting on my Estelle for the Estelle KAL. I am finished with the body and working on the first sleeve. It seems like duck soup from here on out. Markers will help you learn to read your lace. Reading your lace means that you can see what needs to be done next. Put markers between each repeat set. Learn to notice the "line" where the sets of decreases meet in Feather and Fan. I prefer yarn markers so I do not waste time slipping from one needle to the other. The end of the marker can move up each row with the bottom part still in the lower rows. The yarn markers will help train your eye to read your knitting. Count! On the return row, or after doing a section of the lace row, count between the markers to make sure you have the required number for each repeat. Occasionally lace rows will not have the same number of stitches per row but usually the pattern will tell you this. A tip I learned from Meghan on the Stitch It Podcast on taking your knitting back to a mistake and getting it back on the needles. Brilliant! I have a Kindle and a Nook so I compare them and also tell why I enjoy having an e-reader. Both the Kindle and the Nook are great e-readers. I prefer the buttons on The Kindle over the touchy touch screen of The Nook. The reason I bought The Nook was the night screen which enables me in read in bed and other low-light situations. Enjoyed this episode as usual. I am not participating in the KAL but I love the Estelle and have queued it for the future. Looking forward to listening to your progress so I can learn what to do and not to do! Loved the Kindle vs. Nook review. I got my first Kindle for Mother's Day and I'm loving it. I subscribe to "Pixel of Ink" and a few other newsletter that highlight free or almost free books every day. Some are quite good! This week's giveaways look great! Thank you for printing the Hiawatha quote in the show notes, I love it!! Reading it brought back cosy evenings snuggled in by my Dad's side, listening and also feeling the rumble of his voice. It's amazing how a few lines will bring back memories so vividly! If I'm lucky, I'll see an owl swooping along a dark country road here in Maine in the summer when I walk the dog late in the evening. Sometimes it's past me before I realize what it was, they fly so silently! HI Paula, I had to smile remembering some of the awful crafty owls of the 70s. I had some surgery on Monday of this week and I'm supposed to take it easy (no laundry or vacuuming for a month to 6 weeks) so I have to time to catch up with your blog. I've started the Estelle in the colorway Cypress, and am really enjoying knitting along. I've made a couple of dumb mistakes this week but I'm marking it up to having had general anesthesia. I'm so into listening to audiobooks from Audible.com I haven't gotten into the ebooks. I love to listen and knit. Have been meaning to let you know how much I like the new logo--very cute and oh so appropriate. The comment about the crafty owls of the 70s made me smile, too. I remember making a macrame and latch-hook one in--what else--brown, cream and orange. Not what I'd want in my home now but back then it was cool. Oooo, I've had the Be Mine collection in my cart since you reviewed it a few podcasts ago. I just love it. It will be in my library one way or another but to win it would be nice! Paula, your Estelle is looking great. I love that color. Should be very wearable. The Be Mine collection is on my wish list too, all are very attractive. Your Estelle is looking very nice and has such a nice fitted design. Thank you for reviewing the Kindle and the Nook- I've been contemplating an e-Reader for a while and it's always good to hear more opinions! Just had a listen while spinning. Enjoyed it as always. Your Estelle is looking very nice. My son has a Kindle, so I found your review interesting. Very beautiful ending music--I like it! Thanks for all your hard work. It's appreciated! Your Estelle cardigan is a really pretty color!! The baby owlet pattern is adorable!! Thank you Paula, for your stories and comments about owls both this week and last week. I was walking on a trail north of Juneau when a Great Horned owl came gliding, silently right at eye level along the trail. Just as I was ready to throw myself down, the owl lifted up and over us and when we turned around it was once again gliding down the trail at eye level. This morning a brown bear came right up to our green house while my husband was working in it. The whales are passing through right now and the eagles are nesting. This is a wonderful time of year. Thanks for the great the tips. I'll try the edge tip and see if it would work better for picking up stitches. I'll have to remember Meghan's tip next time I have to frog something. Could you talk about lifelines sometime? I've never used a lifeline and sometimes I have hoped I had. Any great tips for that? Love the podcast, please include me in the next giveaway! Your shownotes are wonderful, I use your hyperlinks as I'm listening to the podcast. Would love to win a copy of the Rose Beck shawl patterns, as they're so beautiful! LOVED the owl episode! We have burrowing owls here in FL and they're the cutest thing I've ever seen! Another great podcast Paula! I particularly enjoyed your ebook reader reviews. After hearing the reviews, I went straight to Amazon.com and ordered the new Kindle, my first ebook reader! I just love sitting, knitting, and listening to your podcast! 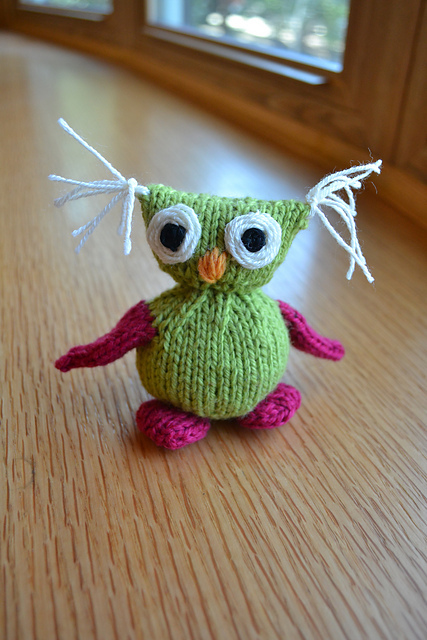 That little owl baby is a definite knit for my *almost* 4 year old to snuggle. Another great episode Paula. About the Kindle: I gave my husband one two years ago and he really likes it. He often reads historical counts of wars and geography and he said he wished the maps could be included on the digital version. Also he uses a little clip on light which has a hood over its top which is very handy and not bothersome to others nearby. I haven't jumped on this band wagon yet since I enjoy audio books so much - has to do with my knitting obsession so I can do both at once. I think the Nook would be nice for magazines though with its color capabilities. I saw one that touted an animated cover. Very modern eh? I am definitely going to make an origami owl bookmark! Love the shawls, I checked them out on ravelry the last time you mentioned them. I purchased the nook color because I wanted to use it for knitting patterns, especially now with the pdf app. I also would like to be able to have my knitting magazines in e reader format someday- to cut down on the clutter. Another major reason for the nook purchase was the ability to borrow books from the library- a big advantage over kindle. Love the podcast! Paula, I so enjoy your podcasts. I haven't had time to listen for a while so I have been catching up the past few days. I love to knit and listen to you. I love the Be Mine shawls, I had just heard about them yesterday when listening to a previous show, hope to knit them this summer. Thanks so much for all the wonderful information. Shawls are my new thing and the Be Mine collection would be great to knit. My church has just started a knitting group and I hope to be able to knit shawls to give to our shut-ins. I loved the podcast. I'm going to check out the birding app it sounds great. You mentioned you like funny things. Recently a girlfriend recommended Jeanne Robertson to me, she's very funny. She has a few stories on Youtube. When you have a moment you could go give them a listen. Don't send your husband to the grocery store is a favorite, I was listening and thinking well this is amusing but not great, but you keep on listening, and pretty soon you're rolling on the floor. Good stuff. Please enter me in the contest. Your shawl is beautiful and I'd love to make one of my own. I've resisted many times the urge to purchase the Rose Beck ebook. I really want to make Sugared Violets, but I've had to put it off for other projects. It's really a matter of deciding whether to buy the individual pattern or the entire book. Of course, if I *win* the book, I won't have to struggle with that decision anymore. And the baby owl cardigan is pretty sweet, too. Thank you for the tip for picking up stitches from Meghan...I love these sort of "thinking knitter" type helps...it's so smart. Hope to win either of the giveaways! Hi Paula!! I would ♥ a copy of Be Mine!! Pick me!! Paula, I have a Kindle, and love it! It was interesting to hear your comparison to the Nook. I would also love the shawlette booklet. Those all look like fun knits! Thanks for your podcast. Thanks for another great podcast. Loved hearing the follow-up comments about the Owl episode. I always learn something knitting and non-knitting related by listening to your podcast! I really liked your comparison of the e-book readers. I'm still not sure if I will ever get one, but this information helps. I love that Be Mine collection, so if I actually win one, I can take it out of my cart, LOL. Love the Be Mine collections, have had them in my queue. I don't have an iPhone, but what I think would be really cool is an app that you can push the button, it records a bird's song in your backyard, then tells you which bird it is! So many times I hear a bird but can't find it, and I just want to know what kind of bird it is from its beautiful song. Another great show, Paula! I love the Be Mine shawlettes. My daughter especially likes the "And So Are You" and I think it will be perfect for her to take to college next year. If I do not win, I will have to buy the ebook! Thanks for recommending these lovely knits. Paula, thanks for the Kindle/Nook comparison! I just acquired a Kindle, and am having fun getting acquainted with it. Your Estelle is beautiful! I'm hoping that someday soon I will be able to buy the yarn and knit myself one. The Be Mine shawlettes are so pretty - I'd love to have the patterns. Thanks! It doesn't bother me that the video was not of a bird in the wild. It is still a beautiful sight to see a bird in flight and up close. I will never tire of such things! I love listening to your podcast. You make me feel as is we would be fast friends the first time we meet. I too love my Kindle although right now the only thing I do with it is read books and change the font. One day I'll figure out just what the keyboard is for. I'm going to retire from my job in just a few days so will have the time to explore that further. I wish I win the shawl patterns. I want to start making some shawls for my mother & my aunts. All of them are now getting old now & it will be great to share my love for them through shawls that can bring them comfort & remind them of our mutual love! Thanks for the Kindle/Nook comparison. I love my Kindle but was considering getting a Nook as well. Now I think I'll wait and spend the money on yarn! Like you, I'm rather annoyed at how much e-books are costing these days. This could backfire on them since I know I'm not buying as many books as I might have otherwise. Maybe they'll get the message! As always another enjoyable, informative podcast. I still don't have a Kindle/Nook....my reading slowed down so much since I started knitting. Thanks for another informative podcast. I always look forward to listening! Great prizes this week. Thanks to the designers for contributing them. Thank you for another excellent podcast. I've been thinking about getting a nook or a kindle and your review was very helpful. I look forward to listening to you every week! Hi Paula, I loved all the information about owls, especially listening to you do the calls. Thank you for another wonderful podcast! I always enjoy your podcast and learn something new from every episode. Your discussion of the e-readers was very timely as I am contemplating buying one for my granddaughter, who is an avid reader. Your Estelle cardigan looks great! I wish I was knitting along but the timing was not right for me. I'm currently into shawls and shawlettes and would be thrilled to be one of the lucky winners this week. Still loving the podcast, hoping to get lucky this week! Hi, I have been listening for quite awhile, but I listen while I run and then I forget to go to the computer and drop a note! I so enjoy your podcast. I listen from Beijing China and your show motivates me to keep knitting. Last year my son memorized parts of the Hiawatha poem, but did not memorize this stanza. We may need to go back and work on this one! I love this poem. Keep up the good work. Love your podcast. You have a very soothing voice and I enjoy the music you play also. I love the episodes you've done on Owls. I always enjoy seeing and hearing owls and love their mystique. Paula- I so enjoy your podcast and this contest has given me a push to comment on your blog! Thank you for your review of the Rose Beck booklet. It would be wonderful to win the collection, but more likely I will be purchasing it in the near future. Thanks for another great podcast. I look forward to listening to it every week. I own a Nook Color and absolutely love it. One of the great selling points for me is the ability to read PDFs on it. So any pattern written in PDF format can be loaded onto it. That means that I don't have to print out any patterns and I have my patterns and reading books all in one place. I have yet to purchase any books because I get all my books from the library. If your local library doesn't have digital books yet you can join the Philadelphia library for $15.00 a year. That's cheaper than buying one book. You do have to have a computer to transfer both PDFs and library books onto the Nook. But that is a simple process to achieve. I don't know if you can do either of these on the Kindle. I know the original one you could not. Just a little side note, I too had my Nook go crazy on me one time. It sent me to the end of the book when I was trying to turn just one page. After several minutes of frustration I figured out how to get the list of chapters in the book. From there I was able to select the chapter I was currently reading and once I got to the right chapter I was able to turn pages until I got back to the page I was reading. All in all I love the Nook Color and all the things it can do. I'm very happy with my choice of it over the Kindle. Can't wait to hear what you have going on in the next episode. I've never seen a Kindle or any other ebook reader but when I try to use my son's laptop I often end up somewhere else than where I want to be. He doesn't understand how I do it either. I've been frogging Megan's way since before the internet. Love the Estelle sweater. Your wool label--great idea, going to have to try that one. BTW, here's a tip on writing on fabric/wool... iron a piece of freezer paper to the back of it to stabilize. I do that when making labels for my quilts.